Make it easy for your donors to leave a legacy to your charity. 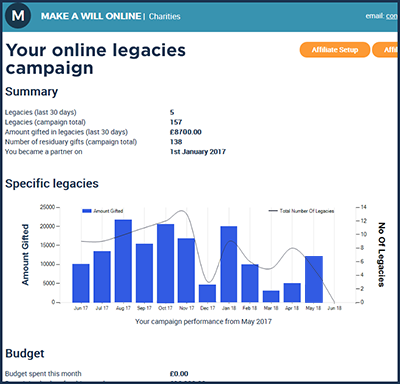 Our online will-writing service for charities puts you in control of your legacies campaign. With no set-up costs or monthly fees, you pay one low fee for each will produced. Direct your donors to a personalised version of makeawillonline.co.uk, where they are given various opportunities to remember your charity in their will. Your charity is invoiced only for any wills made via your campaign, and you receive details of the legacies in a monthly report. With no ongoing fees or setup costs, this is an innovative, reliable way to generate legacies. * Our innovative online will service for charities gives your donors a 24/7, safe and free way to remember your charity in their wills. * Extensive personalisation options mean you can speak to your donors in your language. You can include as much or as little of your branding as you wish. * In-depth campaign analytics and reporting give you the information you need to tailor your campaign. Our service can provide your charity with legacies throughout the year, providing you with industry-leading return on investment. Let’s talk about how we can work together to make your legacies campaign thrive.